Finally! That’s really all that needs to be said. In the realm of tough luck, few anglers can compare to Scott Canterbury. 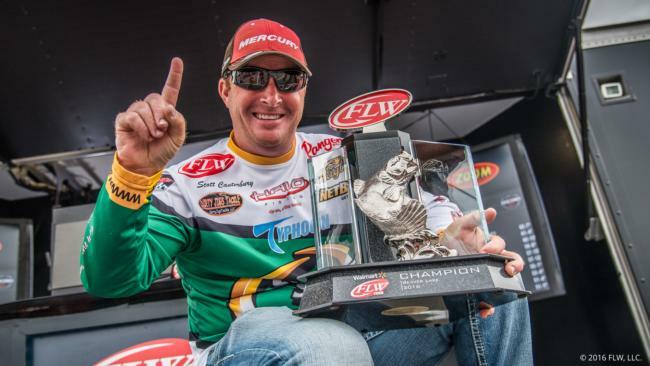 The Alabama pro has finished second four times on the FLW Tour, with two coming at the Forrest Wood Cup – who can forget his agonizing 1-ounce defeat in 2014? But all of that is history now, as Canterbury ground out his first Major victory at Beaver Lake this past weekend, finally ridding himself of the monkey on his back. Not surprisingly, the win didn’t come easy, as weights were tight all week, and a number of pros made things very interesting on the final day. In the end, it was Canterbury holding that long-sought trophy. Along with the relief and helping out his wallet, the victory also did considerable good for his ranking. Canterbury now finds himself ranked in the top 50, having moved up 13 places to 42nd this week. He wasn’t the only pro to climb into the top 50 this weekend. At one time, Darrel Robertson was ranked in the 100s, but his runner-up finish means he’s actually ranked No. 5 in our One-Year Ranking, and now sits in 48th in our Two-Year Ranking. And Jeff Sprague’s third-place finish has him now ranked 44th overall. Of course, Scott Martin only further solidified his No. 1 ranking after finishing fourth at Beaver Lake, and Andy Morgan bumped up two places to sixth. Not to be forgotten, “Mr. Beaver Lake,” Matt Arey once again used that lake to his advantage, climbing more than 20 places to 82nd after his third-straight top 10.